From football games to festivals, fall is always a busy season. Prepping meals ahead of time makes it easier to enjoy home-cooked meals that include fruits, vegetables, lean meats and the health benefits of dairy. Tip 1: Have a plan. Jot down meals and snacks for the week ahead and make a grocery list. You can even write the week’s menu on a dry-erase board in the kitchen for the whole family to see. Start slowly by making one or two family favorite recipes ahead and add more each week. Tip 2: Pre-chop. Wash produce under cool water and allow to dry completely. Then, chop fruits and vegetables for quick meal ingredients, salads and snacks. Store in labeled plastic bags or containers in the fridge. For an easy autumn breakfast, store chopped fresh pear and a half cup of vanilla Greek yogurt in a small bag in the freezer. In the morning, empty the bag into a blender and blend with a cup of skim milk and 1/4 teaspoon of cinnamon. You’ll be sipping on a smoothie in no time! Tip 3: Try salad in a jar. Convert any salad recipe into a “jar salad” by layering ingredients in a pint or quart-sized jar. Start with putting 2 tablespoons of salad dressing in the bottom of the jar. Add chopped vegetables. Next, add protein like shredded cheese, grilled chicken or cooked quinoa. Fill the remaining jar space with salad greens. 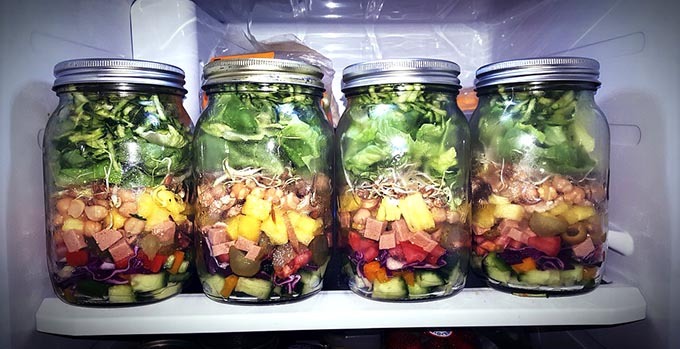 Most jar salads with closed lids stay fresh in the fridge for up to five days. Tip 4: Cook Once, Eat Twice. Keep this concept in mind when you need an easy dinner night. Double chili, soup or pasta recipes to have dinner for two nights, or divide into individual containers and freeze for your next busy weeknight. Janet Seiber is a registered dietitian for the University of Tennessee Medical Center’s Healthy Living Kitchen, where she provides cooking classes and grocery store tours for the local community.